Remembering the composition of these sticky buns takes me straight back to high school. Hot, highveld lunch breaks in Greenside, Johannesburg spent sitting in the sun in the concrete flag stone quad with class mates – idle chatter interspersed with quiet munching. The bell would ring shrilly signally break and on days when I had tuck money I would tear down to the tuck shop to avoid the queue. Lunch would consist of the special of the day and an ice-cold coke or frozen slushy. Mondays hotdogs… Tuesdays hamburgers… Wednesdays chutney mince rolls… Thursdays… Thursdays and Fridays I forget. And if I had scrounged enough money together lunch would be finished off with a big chunk of sticky chelsea bun. The buns would come pre-wrapped in cling film, and I remember them being much bigger than any others I have seen in the last few years, and certainly bigger than the ones I recreated. Sitting cross-legged on the warm concrete I would discard the unwanted cling film and then start devouring my bun by carefully peeling away and eating it layer by layer, spiralling down through moist yeasty bun infused with cinnamon, sweet vanilla custard cream and raisins – all stuck together by the sugary icing on the top. Pure bliss. And certainly enough calories to power me through the next four periods before home time. This recipe is adapted from British Baking by Peyton and Byrne. In a measuring jug mix the very warm water and the cold milk so that the mixture is warm. Add the yeast and stir to dissolve. Set aside. Sift the flour into a bowl and add only 20g of the softened butter by cutting it into small cubes and dropping into the flour. Rub the butter into the flour with your fingers until it reaches a consistency of coarse breadcrumbs. Add the sugar and salt and then stir in the egg. 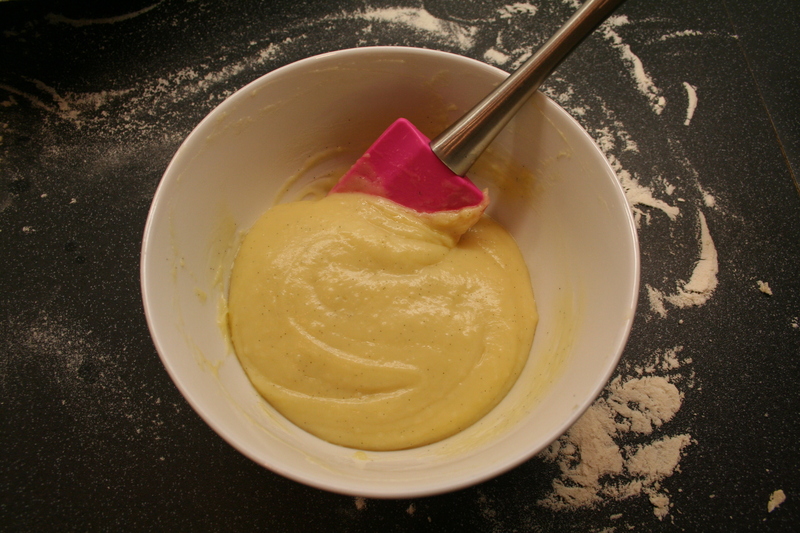 Make a well in the middle of the flour and add the yeast mixture. Stir with a wooden spoon to roughly combine. Once combined turned the mixture out onto a very lightly floured work surface and knead for about a minute. 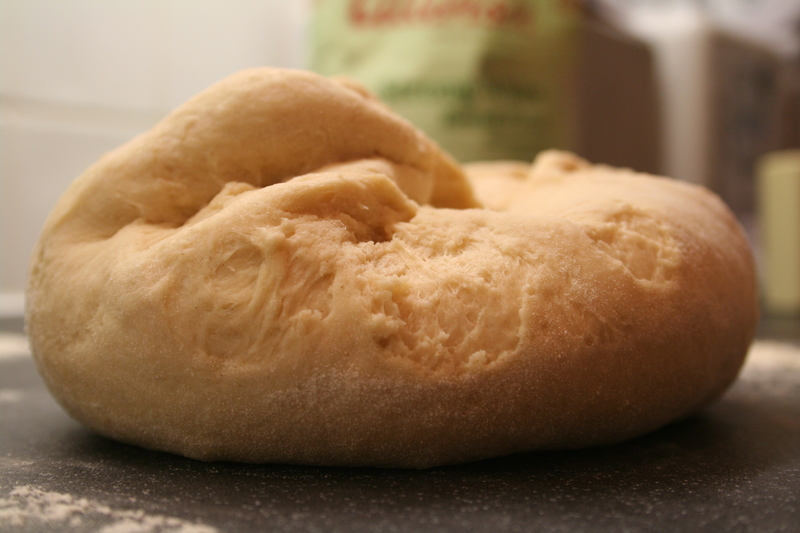 The best way to do this is to knead the dough by pulling and stretching it out with both hands, then lifting both ends up and bringing them down together in the middle with a slapping motion. This will trap some air into the mixture. Put the mixture back into the bowl, cover with cling film and leave to rest in a warm place for 15 minutes. The dough will now be considerably less sticky. Knead the dough with the palms of your hands for about five minutes until it becomes soft and silky. Place back in the bowl, cover with cling film and leave to rise in a warm place for about an hour. The dough should double in size. 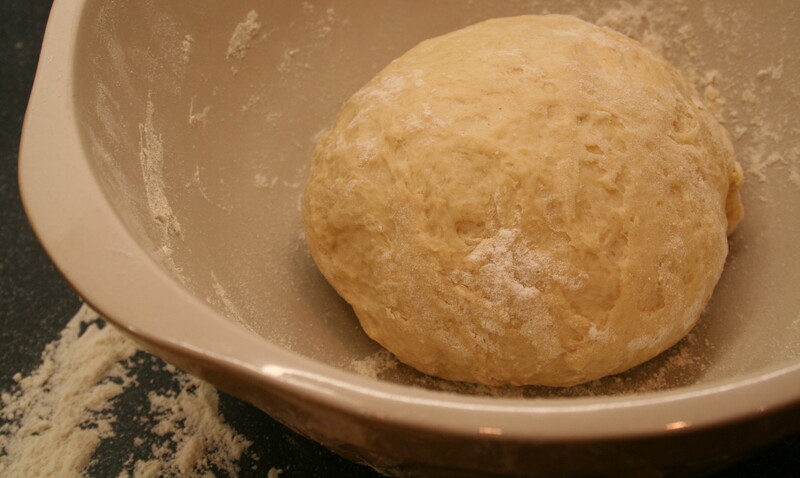 Once risen, roll the dough out into a rectangle about 2cm thick. Cut the remaining 50g of softened butter into cubes and sprinkle on the middle third of the rectangle. Fold the rectangle into thirds, like a letter, by folding the bottom third up over the middle third and folding the top third down over the bottom third. Pinch the side seams to seal in the butter and then roll out into a rectangle of 2cm thick again. Fold as above for a second time and then place the dough back in the bowl, cover with cling film and let rise for about another hour. Repeat the folding and rolling and then cover and let rest for about 30 minutes. While the dough is rising make the pastry cream. This is essentially a crème pâtissière, however this recipe is slightly less hassle to make – and deliciously ideal for this recipe. Heat the milk, vanilla and salt in a heavy-bottomed saucepan over a medium heat. Stirring occasionally to keep the milk from scorching, bring the mixture to just under a boil. Small, frothy bubbles will start to appear on the surface. While the milk is heating, combine the cornflour and sugar in a bowl. Add the egg and mix well. Pour a third of the near boiling milk into the egg mixture and whisk quickly to combine. Then pour this mixture back into the saucepan with the remaining hot milk and whisk together. Return to the heat and whisk continuously until the mixture thickens. This will happen suddenly after a couple of minutes. Remove from the heat as soon as the mixture thickens. Be careful not to over cook the pastry cream or it could curdle. Pour through a fine mesh sieve into a bowl to cool. The mixture might seem too thick to go through a sieve, but it will. Give the pastry cream a couple of stirs to release hot steam and let stand for 10 minutes to cool. Cut the butter into cubes and stir into the pastry cream. Do not over stir as this will thin the cream down. Cover with cling film, pressing it directly onto the surface of the cream to prevent a skin from forming and allow to cool. Although raisins are more authentic for this recipe, it is as delicious with chocolate chips – depending on personal preference. 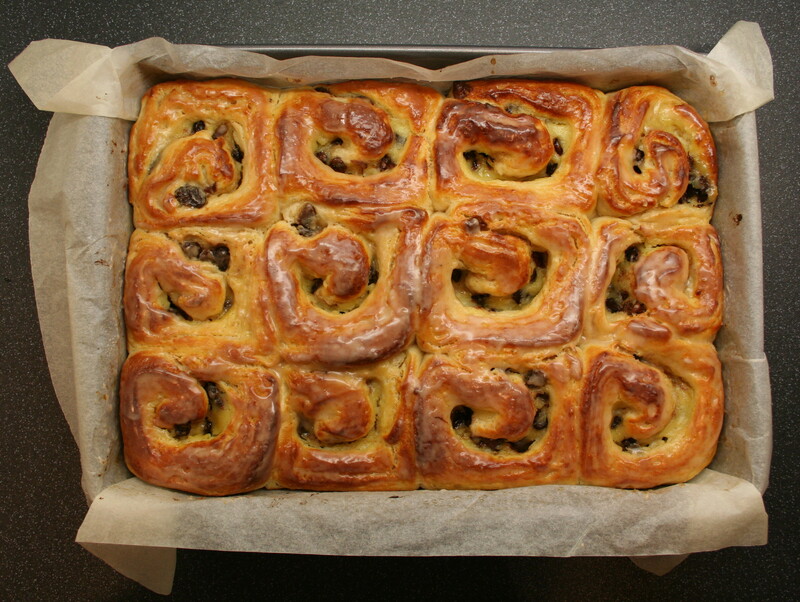 I made half with raisins and half with chocolate due to my other half’s aversion to raisins. Preheat the oven to 220°C (200°C for fan oven). 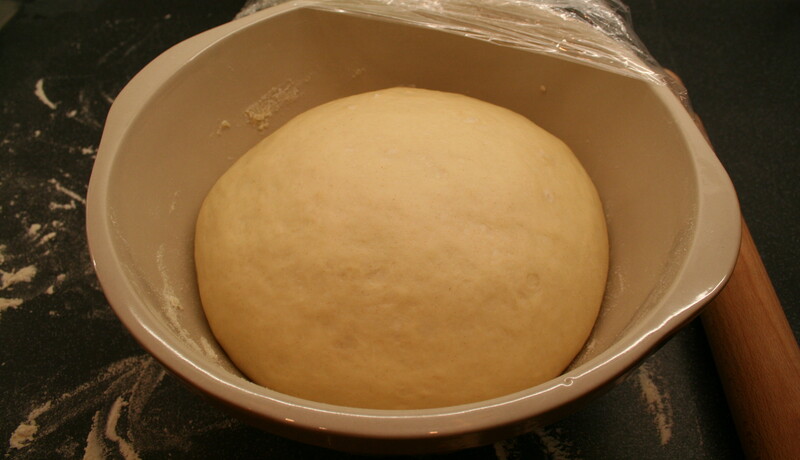 On a lightly floured surface roll the bun dough out into a rectangle measuring about 25cm wide by 40cm long. 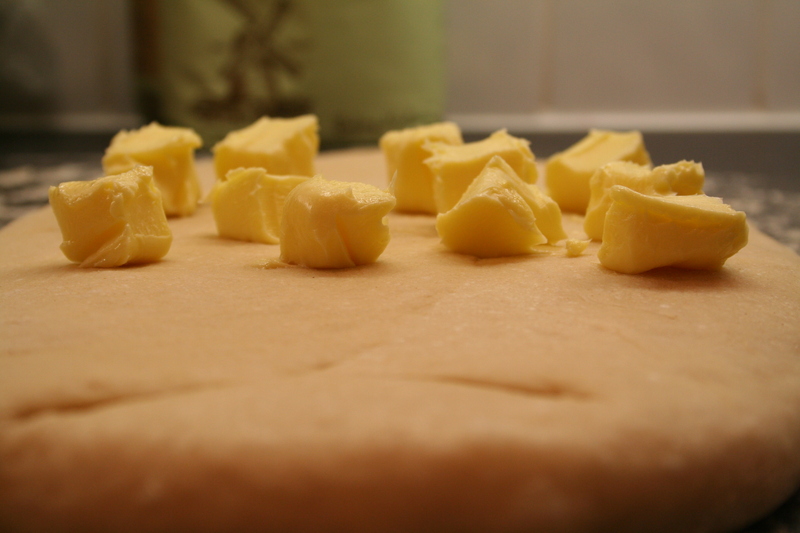 Spread the pastry cream evenly onto the dough leaving a 2cm border around the edge. 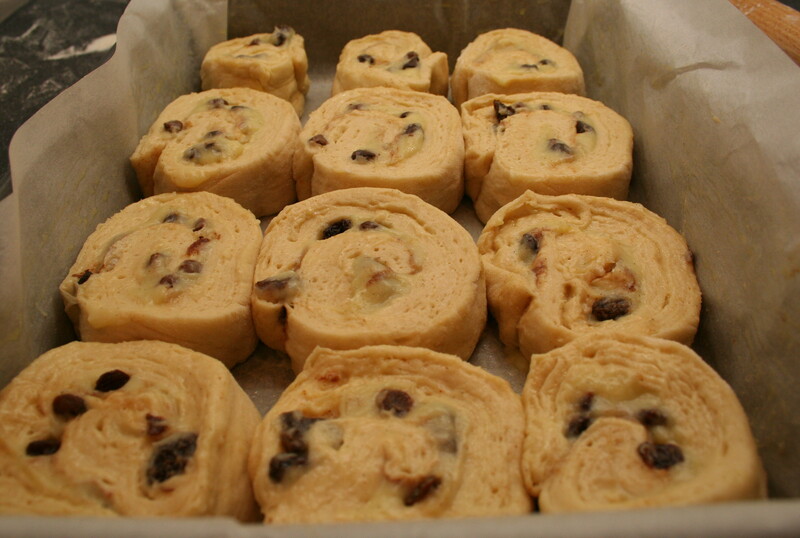 Sprinkle the cinnamon and raisins and or chocolate chips over the pastry cream. Using your hands, gently roll the dough into a tight roll – like a Swiss roll. Make sure that the seam is at the bottom facing down before cutting. Using a very sharp knife, cut the log into 12 slices of equal thickness. Place the slices in a grease proof paper lined baking tin so that all the slices are touching or almost touching. Mix the egg and milk and brush over the top of the buns. Cover loosely with a clean tea towel and leave to rise until the buns have doubled in size – this should take about an hour. Once risen, bake the buns for 15-20 minutes until golden brown. While the buns are baking prepare the bun wash by adding a few drops of water at a time to the icing sugar until the consistency is a thick liquid. As soon as the buns come out of the oven brush the bun wash over them. It will solidify into a shiny glaze immediately. The buns are best eaten the same day – although will keep for a day or two. This entry was posted on Sunday, September 25th, 2011 at 21:03	and tagged with buns, crème pâtissière, pastry, vanilla custard cream and posted in filling flavours, pastry. You can follow any responses to this entry through the RSS 2.0 feed. Looks like a great recipe, and I am willing to try it. I will use the currants as I do not like chocolate chips. You won’t be disappointed… You can substitute the chocolate chips for any of your favourite dried fruit or nuts, or leave it out all together. Happy baking! Ah – you make me happy. Such wonderful memories. The endless african sky, the sunshine, the warmth, the Chelsea Buns! I remember Boerewors rolls and toasted cheese sandwiches as well, but no idea what day. Could anything so yummy really be unhealthy? Lovely writing, excellent recipe, and beautiful photographs! I’ve been researching Chelsea Bun recipes today and yours is the only one I found with the much valued Vanilla Custard touch! I’m in Johannesburg, South Africa (Midrand more specifically) and the Chelsea buns here are easily 15 to 20cm in diameter and about 6 to 8cm thick! At the wonderful bakery inside the SuperSpar on New Road I hand pick them and sometimes ask for extra glazing. Two of those buns quartered makes a filling tea-time treat for our family of six. I love unwinding and breaking the bun, dipping the crusty outer parts in my tea like a rusk… yummmmm! Thank you so much! Lovely to know that anyone, besides my Mom, reads my blog. 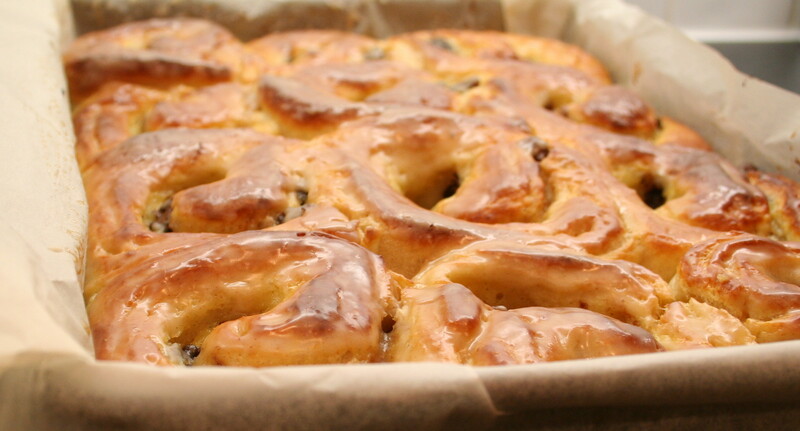 Can’t believe this is the only recipe you found that uses custard… although, that said, I’ve lived in London for seven years now and have never come across the chelsea buns I grew up with in Joburg – the ones you describe. If you do try the recipe – please do let me know how they turned out – and how your family of six enjoyed them. In Australia we call them “Escargots”. Luckily my friend told me about it. 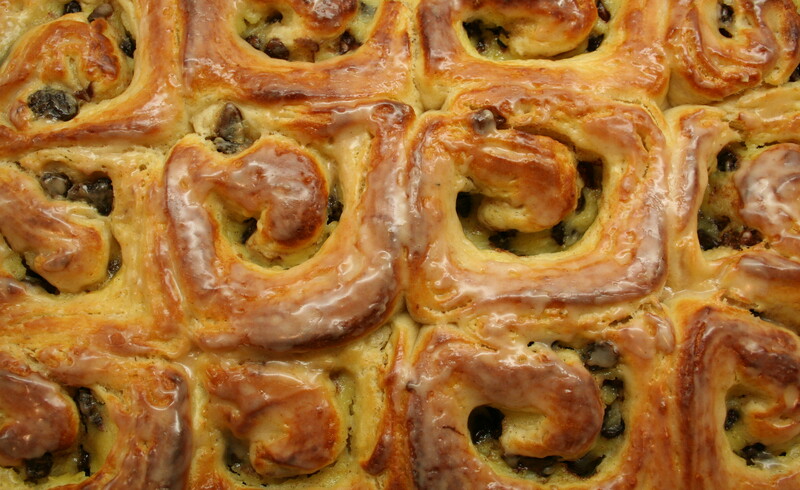 I love them and next time in Cape Town I will seek out the ‘original’ Chelsea Buns. 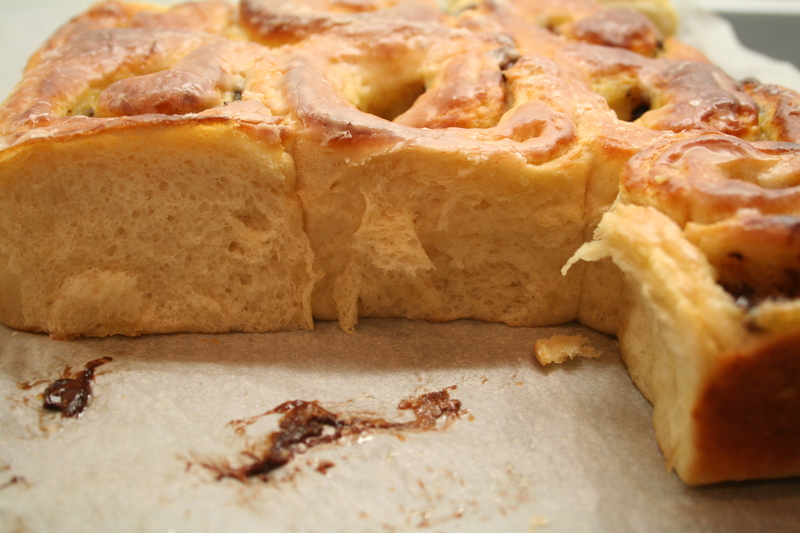 im living in switzerland, I also went to school in Greenside High and also remember those fantastic chelsea buns. They were truelly the best. Hi were have been living in Scotland for the past 10years. We all grew up in Jburg and Pretoria. My husband kept on mouning about not beeing able to find “real” chelsea buns here. He was the one that found your recipe on the internet, and I had to make it that day. First try I failed as I did not have the right flour and I mixed dried yeast with the water and milk and it did ot work lol. The next day I went out got the right stuff and from them on I have been making them almost every weekend. Today I’m doing 2 batches, 1 chocolate chip and his fav raisens. All the Scottish neighbours can’t wait for the next batch. Thank you for bringing a bit of home back to us. It’s a pleasure! I hope they don’t disappoint. Do let me know how they turned out – so lovely to hear when people use recipes on here. So, I made these today, I wish I knew your name because it will be spoken with reverence in this house from now on. They are amazing! Everything I remembered them to be. I posted a picture on facebook and a guy I went to school with who now lives in Oz asked for the recipe too. Seriously people, this woman knows her stuff! My name is Gudrun Heckl. Thank you so much for the feedback – I’m so pleased they turned out well and you have a little piece of home in London! I know what a difference that makes. I need to, and will, start posting more – you can subscribe to the page to get the latest posts. Living in Australia – grew up in JHb, near Greenside – have to say – don’t think the Escargots here match up in the least (nice as they are). Easter now, suddenly had a craving for a good ol’ Chelsea Bun and also searched high and low before finding one with the custard. Made them today – ashamed to say 4 of us polished off 12 buns 🙂 absolutely delicious! thank you for great recipe – a delicious texture and sublime tasting. Little bakery in York, UK, also makes divine Chelsea Buns (just in case anyone is there).